1. Applications may be submitted between April 19 and June 17. Hard copy applications only please, no emails. 2. You should return the application forms and a signed waiver, and keep the other three items for future reference. 3. Camp is still free for kids of Ancram residents, and $75 a week for non-resident children. 4. Only 65 kids will be accepted for camp this year, and Ancram kids will have first preference. 5. Kids from 4 to 12 will be eligible for camp. 4 year olds will have to have a year of preschool to qualify. 7. Parents will be required to attend a mandatory orientation on either May 18 or June 15 at 10 or 2. Please RSVP which session you plan to attend to me at sarahmason813@gmail.com. Open swimming: Mon, Wed & Fri 1pm to 6pm; Tues, Thurs, Sat & Sun 10am to 6pm. 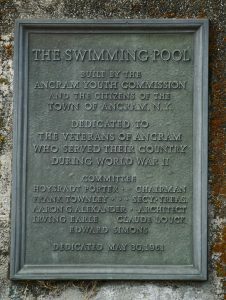 Costs: Ancram Residents: Free; Non Residents: $3 a person per day or $50 for a family season pass (includes swimming lessons). The Ancram Youth Commission would like to thank all those who donated to their time or funds to the building of the new playground at the Ancram Town Hall. The project was extensive and without the help of many in the community would have never come to completion. The Commission members are extremely proud of what was accomplished. Please come out and enjoy this wonderful structure!